When I was a little kid, my sisters and I weren't allowed to watch TV. We didn't mind - we were always reading or doing something imaginative. My parents (my mom especially) really valued creativity, and I'm really grateful for that. We weren't completely deprived of kid experiences, though, so some movies were allowed. When we watched movies, it was either Disney stuff, or any of the VHS tapes we could rent at the library. Some of our favorite movies from the library were the old 1960's cartoons - especially the French cartoon "Astérix et Cléopatre" dubbed into English, and musical Dr. Seuss cartoons. One of my favorite Dr. Seuss tapes was called "Seuss on the Loose," and it had cartoon versions of three stories: "Green Eggs and Ham," "The Sneetches," and "The Zax." The first everyone has heard of, and the second is surprisingly well-known. The third, though, I find most people have not heard of, and it's really a shame, because like all of the best Dr. Seuss stories, there's a really valuable lesson to be learned. One day, two Zax are walking: one is headed north, the other is headed south. 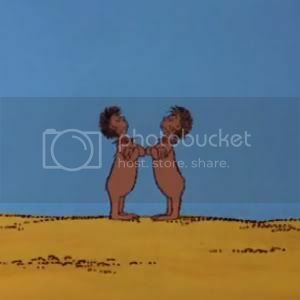 They are headed towards the same point, and they finally bump into one another in the Prairie of Prax (ah, rhyming ... it is, after all, a story by Dr. Seuss). They both tell the other to step aside so that they can keep moving, but neither one will take even the slightest step off his path. The North-going Zax says he's content to stay put even if it takes fifty-nine days; not to be outdone, the South-going Zax reaffirms that not only will he take "not a step to the West, not a step to the East," but that he would stay there in his spot for fifty-nine years. The South-going Zax continues: "I'll stay here not budging, I can and I will, if makes you and me and the whole world stand still." Unfortunately for the Zax, though, he's wrong. 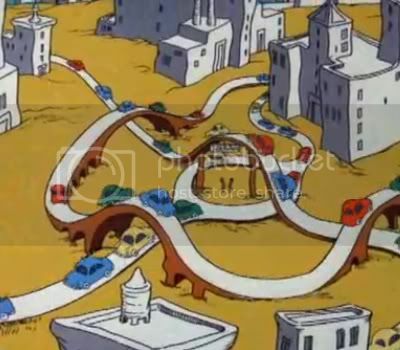 Life carries on, and those two Zax the only ones that stay put - a city and highways even develop all around them! I've been thinking a lot about this story lately, for a few reasons. First, because in a lot of ways, these two Zax are like Jill and me. One of the things I love most about our friendship is that we're best friends despite so many differences, but one huge common flaw is how stubborn we both can be. There was a four month silence between us and a presumed dead friendship, all because of misunderstandings and a mutual avoidance of confrontation. We just stood for months and months as our worlds grew and changed around us. But also, I feel like I can relate the story to my recent weight loss struggles. There's the me that knows how good working out, eating well, and losing weight feels, and she's headed in a good direction. But then there's the me that can't let go of wanting to sit on the couch, watch movies for hours, and eat entire blocks of cheese. She's facing an entirely different direction. And neither one wants to budge. It's hard enough with the demands of everyone and everything else in this world, but when the internal ones start dueling, it can be overwhelming. I've come so far already, though, so unlike the Zax, I'm willing to step aside a little in order to continue to make progress on my path. I just need to work on compromising my two conflicting sides: for example, not feeling guilty when I need to choose work over the gym, or not letting one bad day become an end-all complete failure. Awesome metaphor - and sooo true! The "old" me would have defiantly chosen to stay for 99 decades just to prove how "right" she was! Great post!!! I totally understand the standoff!!! I am learning to step aside and let the healthy part of me take over!! love this comparison, Mary. SO true in so many ways - I can even relate to this regarding my own weight loss. I've been at goal for a long time but still miss that part of me that ignored all sense of responsibility (although I do realize how destructive it is). Glad that you and Jill are on the mend. Like fatgirlwearingthin, although I've been at goal for a long time, it's still a struggle against what I still consider "the real me." I just don't think I can ever let that go and claim this life as my truth. I get frustrated because I know I MUST live this way in order to be healthy...for myself and for my family (and most of all for my little boys). But deep down inside it is not who I am. On my blog I say I am a fat girl living in a thin girl's body and I think I will always feel that way as long as I am thin. Yes, I feel strong and capable and am proud of myself for the good choices I make. But I am also always at least a little resentful of those choices (and sometimes more than a little). And sometime I just throw up my hands and go through a phase of laziness and indulgence. I had a phase like that over the summer and it has take me over three months to get back to my fighting weight (well, I don't weigh, but I know from my clothes where I'm at). Oops, sorry to go on and on. You are not alone! I'm reading Geneen Roth's book (Women, Food & God)now...maybe it'll help me. Wonderful post, Mary. 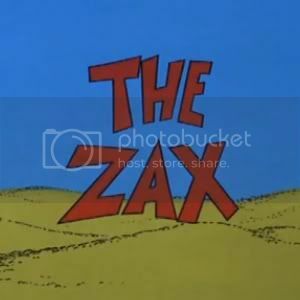 I'd never heard of The Zax before. I can totally relate to having those two opposing sides in me, too. We all have those two sides. There's the side that says stay in bed and the side that says to get up and get moving..start the workout, walk, etc. It's a constant struggle but its worth it! So I assume that you and Jill have yet to speak? I'm holding out hope for you guys! My closest friend Stephanie and I didn't speak for 3 years nearly because someone told her things that I "supposedly" said that I did not say. She reconnected with me years later and we are the closest friends today. It will happen, good friends don't come and go like that...she'll be back!